Looking for a job can be stressful. While job search engines are great, using social media to land a job is a sometimes overlooked, but fantastic tool in finding a job. It allows you to showcase your work how you’d like, be creative, and connect with people very easily. The most important social media to use in your job search is LinkedIn, since recruiters often search the site for potential candidates and job searching is it’s primary role. Use your job title or summery to mention that you are looking for a job and describe the position you’re looking for. Be sure to create a fantastic LinkedIn profile by asking for recommendations, adding skills and expertise, describing your education and work experience, joining groups, and connecting with people in your field. Twitter is an easy way to network since you can follow people you haven’t even met yet. Follow people in your field, past colleagues, and old classmates, and simply send a brief message that you’re looking for a particular job and ask them if they know of any availability. When making your profile, keep it professional, include a brief description of qualifications, a link to an online resume, and mention you are looking for a position. Start following appropriate news sites and publications in your industry. This will not only keep you updates with your industry, but you’ll start to appear as a suggestion for people who follow similar people, thus getting your job search more exposure. Search for job listings to follow with your specific career. For example, I follow @journalism_jobs because I’m in journalism. Just like with Twitter, Facebook allows you to “Like” companies you might be interested in working with, job agencies, your college’s alumni group, and any page that may offer job search advice and listings. Be sure to limit your privacy settings, and be conscious of what you’re posting if you are mixing professional and personal. Instead, consider having two Facebook accounts. One can be for friends and family to post photos of you, tag you at places, and other features, while your professional can focus on an elaborate profile detailing your resume and qualifications. This way, with your professional page, you can message businesses, old colleagues, and others, and your message won’t get lost in the shuffle. If you can offer something visual for your prospective employers, join Flikr, Instagram, and Pintrest. Photographers, fashion designers, stylists, interior decorators, make-up artists, and many more professions can take advantage of this to broadcast their work. Just like with Twitter and Facebook, be sure to extensively fill out any profile with information about your education, past work experience, qualifications, and that you are looking for work. Keep your full name or at least a professional name for your usernames. Be sure your photo is professional as well. Limit what you post to professional, on-point postings. If you have a portfolio or blog, link it on your profile. Try to connect with many people, but mainly relevant people. Use social media not just to post, but also to interact with people. 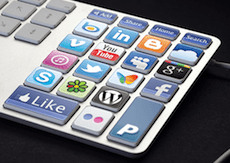 How can you use social media to help with your job search? Social media is huge in looking for a job, especially LinkedIn. Now that we run our own business we have found that it’s still a great tool to use and have gotten a number of solid clients from it.